This is really beautiful, Sylvie. Would be lovely framed! Have a great time in the Uk, it is very hot here aswel around 35-40°C. 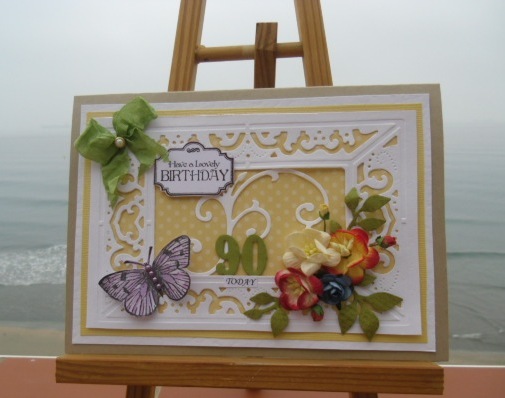 Lovely card for a great lady..
Beautiful card Sylive, I like the design the flowers and the butterfly, Thank you for joining in with us at Hooked on Craft this month, Good Luck. ps enjoy your week and the party. Beautiful card Sylvie...and you have reminded me I have this emboss and die template tucked away! Oh love your gorgeous card Sylvie, beautiful details. Make sure you bring your brolly to the UK. Thanks for your lovely message on my blog - your cards are all beautiful! Beautiful card - your friend is sure to be delighted with it. Ooh this is fab !!! I have that folder but never use it ...... maybe it needs a dusting off !!! Hi Sylvie, this is wonderful, so elegant. Love the frame and fab detail. Wow, hope I'm so active when I'm 90. Have a fab time and well done with the weight loss. Oh this is so lovely Sylvie! So elegant! I read this post completely regarding the resemblance of most recent and previous technologies, it's awesome article.